Maybe doctors of the early and mid 20th century were just really ahead of their time. Cigarettes, it seems, may be healthy for at least one thing: steel. A recently published Chinese study says that chemicals drawn out of cigarette butts by water can protect a type of steel most commonly used in oil drilling operations. The finding is considered potentially useful for the industry because of the millions of dollars companies spend annually to replace this corroded steel. It’s considered important for the world because there aren’t many, if any, more common types of trash; and it’s a type of trash that emits fish-killing chemical that ultimately find their way into rivers and oceans. It’s considered important for China because the county hosts the lion’s share of the world’s smokers (and cigarette butts), as well as the planet’s biggest smoke stick factory. 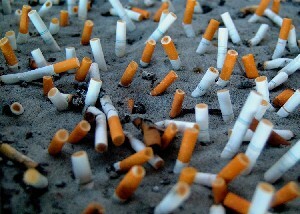 Because of how cigarettes are often disposed, like flicking on a sidewalk or beach, and how they degrade, recycling is likely a better option than any ordinary manner of disposal. The study, authored by scientists in Xi’an, China, has been published in the journal Industrial & Engineering Chemistry Research. No word yet on how all those stubbed out butts might be collected.